I've attached a PDF with the stratigraphy model derived from boreholes I need to replicate in Rockworks. What is the best way to get the solid model or to construct top/botton of grid files to get profile? Drawing profile by hand suggests me the Hypothesis 1 (PDF), while using Rockworks I choose the Hypothesis 2. I divide material B in B1 and B2. Material B1 is on top of Material C. Material B2 is on top of Material A.
I'm using the natural deposition order hypothesis (PDF). At the end of the gridding process I will edit Material B2 to set the same color/fill property so that in profile section I get the same hand drawing profile from Hypothesis 1. I've never used Lithology model approach, should I give it a try? Organizing discontinuous materials into stratigraphic layers can be daunting, particularly without context of the entire project - another correlation possibility is shown here. You might try using lithology modeling to get an idea of project-wide distribution of the materials - this can make it easier to glean major versus minor lenses, as well as determine stratigraphic groupings. The Stratigraphy / Pick Contacts tool can be used to display lithology logs (and even existing strat picks) and pick unit placement, with the correlation panels displayed on the screen. 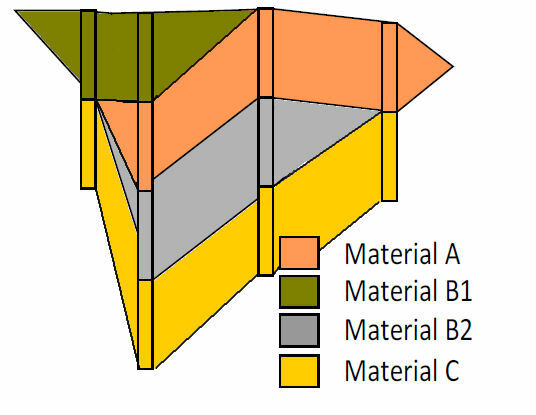 In my point of view this is not a correct correlation as B1 cannot stand above C.
You might try using lithology modeling to get an idea of project-wide distribution of the materials - this can make it easier to glean major versus minor lenses, as well as determine stratigraphic groupings. I will try to get a lithological model.